When you’re making your rounds of gift shopping, you’ve got one option this year that wasn’t entirely available before: cannabis. For recipients over 21, there are adult-use THC products a plenty to stuff stockings, and that’s just the beginning. Non-psychoactive CBD is officially in everything now, too, including some really lovely gift-worthy luxuries. Take a peek at some of our favorite picks and ensure this holiday will be your most chill ever. Who doesn’t want some holiday bliss? This gift set it perfect for your favorite elf who wants to heighten the joy and good vibes of the season and new year to come. dosist bundles their Bliss pen with a custom aromatherapy candle in one cute pack. Gift sets are also available in their Sleep, Relief, and Calm formulations. This limited-edition tasting flight offers a new experience for each night of the festival of light(-ing up). 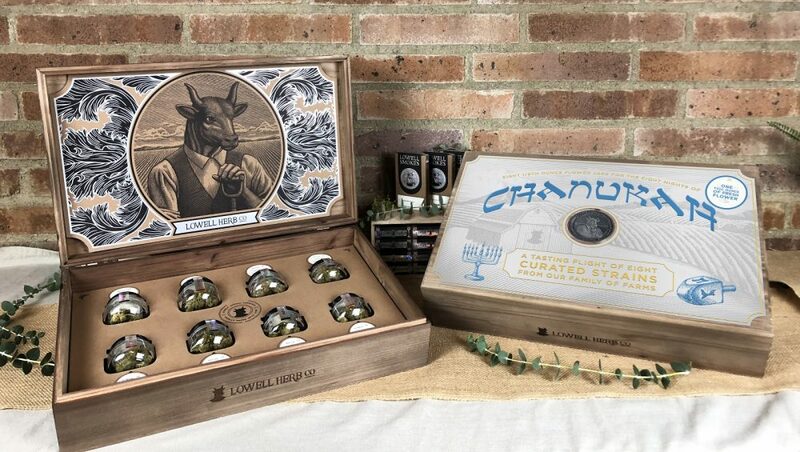 Each vacuum-sealed vial contains an eighth of an ounce from a unique, curated strain, packed in a sturdy wood crate (menorah bong sold separately) The brand is also offering a limited run of pre-rolls in a seasonal Christmas blend designed for holiday cheer. Beboe, the Lake Bell-backed cannabis brand known for its stylish packaging, offers this cute gift set for the holidays which they suggest as a perfect stocking stuffer or starter kit for a user new to cannabis. The box includes a box of their signature “inspired sativa” cannabis pastilles candies and a rose gold mini-vape pen.